Market consolidation and a dominant role for Aeroflot have produced the foundations for what is now a sustainable domestic Russian industry. But it has come at a cost. Russia’s aviation remains heavily concentrated around Moscow and availability of low prices has meant that many potential air travellers are still surface-bound. As Aeroflot plans its own new LCC subsidiary, there are changes afoot which promise considerable upside in air travel for this potential-rich country. The long-established carrier should again find itself in a strong position to expand profitably, even where new entry occurs. Aeroflot expects the number to rise to almost 83 million in 2013 and 106 million in 2017. International passenger numbers overtook domestic numbers in 2012, when they accounted for almost 39 million of the 74 million total. As in other countries, Russia was not immune to the effects of the global financial crisis. However, in spite of a 4% fall in 2009, passenger numbers have increased at a compound average growth rate of 12% pa between 2008 and 2013 (using Aeroflot estimates for 2013). International numbers have grown faster, at 16% CAGR. 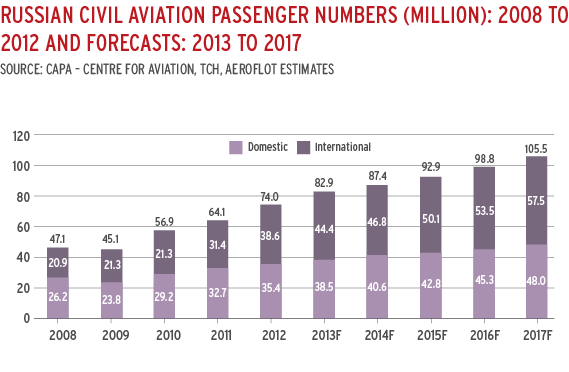 Growth rates for total passenger number are forecast to settle down from double digit levels to between 5% and 7% over the next four years, but these rates are still significantly higher than the 3.9% CAGR forecast by IATA for international passenger numbers in Europe from 2013 to 2017. The potential for further growth in the market for Russian air travel is highlighted by the country’s current low levels of penetration compared with more developed markets. According to data presented by Aeroflot, Russians took an average of 0.3 air trips each in 2010, compared with 3 trips taken by US citizens, 2.3 by those in the UK and 1.1 for Europe overall. 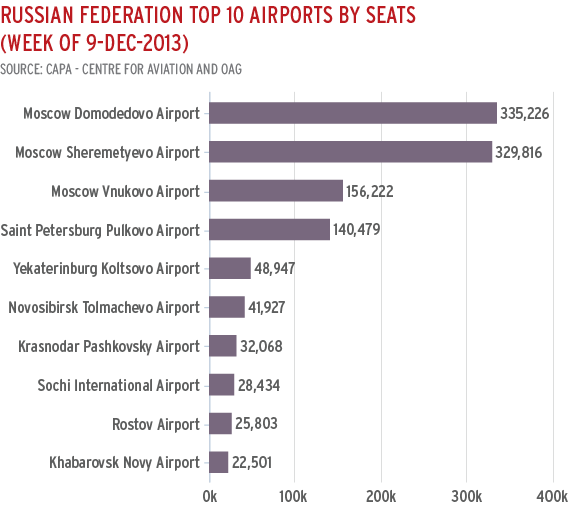 According to data from OAG for the week of 9-Dec-2013, Moscow’s three airports account for almost six times the number of seats of the next largest city, St Petersburg. The two leading Moscow airports, Domodedovo and Sheremetyevo, each account for more than twice the seats of St Petersburg. Outside Moscow and St Petersburg, airport size falls away rapidly, with the number five airport, Yekaterinburg, having only slightly more than one third of St Petersburg’s seats. 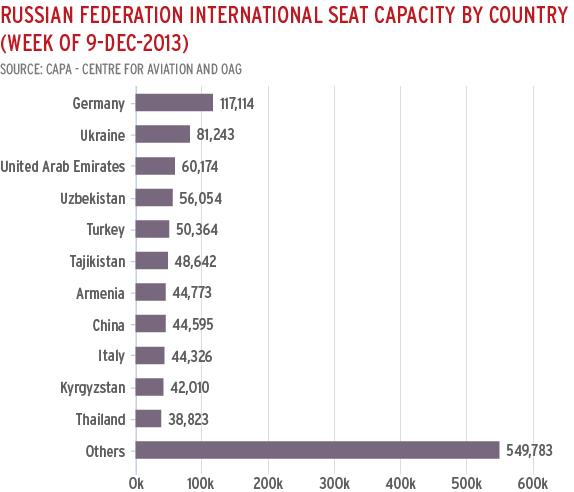 Russia has one of Europe’s most significant domestic markets, with 48% of airline seat capacity that touches Russia flying within its borders (source: OAG, week of 9-Dec-2013). 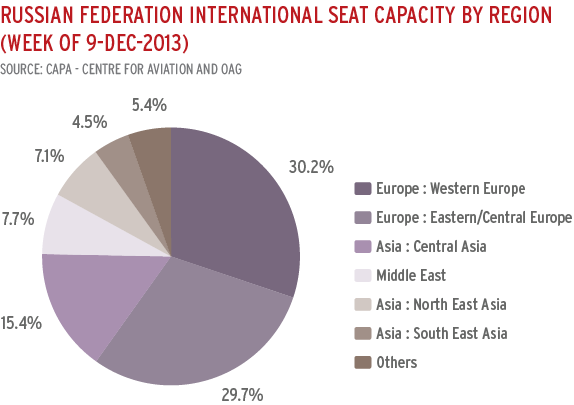 International seat capacity is roughly equally focused on Western Europe, Eastern/Central Europe and Asia (around 30% each), while the Middle East accounts for 7% of seats. North America does not account for a significant share of capacity to/from Russia (and this is reflected in Aeroflot’s absence from the North Atlantic JV within SkyTeam). Germany is Russia’s most important country destination by seat capacity and Western Europe is also represented by Italy and France among the top countries connected to Russia. China, with whom Russia shares a significant border and which is the second largest country after Russia on the Eurasian land mass, is only the seventh ranked destination by seats. The other countries in Russia’s list of top destinations are in Eastern Europe and Central Asia. This has been prompted by the Government’s “national champion” policy towards Aeroflot. Moscow-based Aeroflot acquired Rossiya (St Petersburg), Orenair (Orenburg) and two carriers based in the Russian Far East, Vladivostok Air and SAT Airlines, in Nov-2011 from the Russian state. The latter two subsidiaries were merged in Nov-2013 to form a new carrier, Aurora. Donavia (based in Rostov) has been a 100% subsidiary of Aeroflot since 2007. 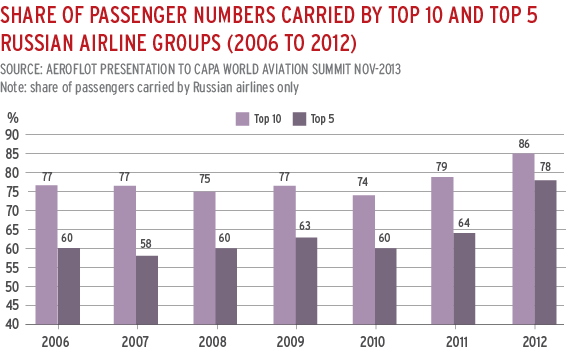 This has led to considerable concentration in the Russian market, with the share of passengers of the top five Russian groups increasing from 60% in 2010 to 78% in 2012 (note: this is the share of passengers carried by Russian airlines only). 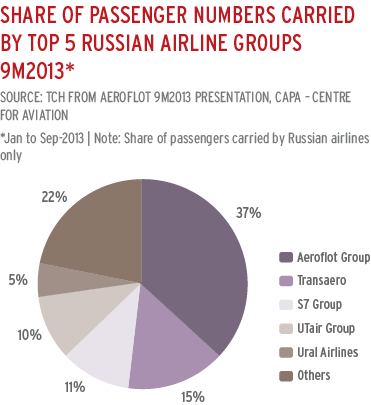 Aeroflot’s subsidiaries account for about 13% of passenger numbers, and explain most of the increase in the market share of the top five Russian groups from 2010 to 2012. The Aeroflot Group now has a share of passengers carried by Russian airlines of 37% and expects this to increase to 40% for 2013. Its share is as big as the combined share of the three next largest groups. The Russian market remains very much the preserve of Russian airlines. Local carriers operate 78% of all movements and almost 100% of domestic movements. This is a much less open market than other large countries in Europe. For example, local airlines account for 57% of seats in Germany and 58% in the UK. In Poland, local carriers have only 22% of movements (source: OAG, week of 9-Dec-2013). On international routes, this has reflected the difficulty experienced by foreign LCCs in obtaining traffic rights. This is now changing slowly: for example, flydubai operates to eight destinations in European Russia; easyJet is now well established from London and Manchester to Moscow; Wizz Air flies from Budapest to Moscow; and Ryanair has obtained permission to fly from Dublin to Moscow and St Petersburg from Mar-2014. 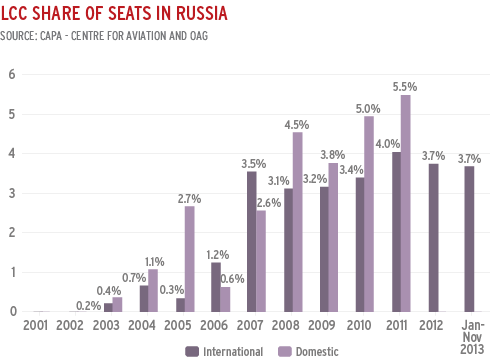 Nevertheless, LCCs still have less than 4% of seats on international routes to/from Russia and this share has not changed much over recent years. The highest ranked LCC, flydubai, is still only at number 22 in the list of all airlines by international seats to/from Russia. LCCs have not been a feature of the domestic Russian market at all since the collapse of Avianova and Sky Express in Oct-2011. This is set to change, too, perhaps more dramatically than on international routes. Legislation was expected by the end of 2013 to allow domestic airlines to adopt LCC product features such as non-refundable tickets and separately charged check-in baggage, in addition to permitting the recruitment of pilots from foreign countries. The carrier, to be led by Vladimir Gorbunov, expects ticket prices to be about 40% lower than mainstream carriers, stimulating new demand. Adopting classic LCC strategies, it expects to achieve lower costs through seat densification and direct sales channels. In addition, the new LCC plans to maximise revenues through the unbundling of features such as checked baggage, priority boarding and catering and to generate ancillary revenues through its website. Aeroflot plans to base the new LCC at a Moscow airport, initially with a fleet of eight Boeing 737-800 aircraft, and to focus on the most popular destinations in European Russia initially. Aeroflot says that it will grow the Dobrolet fleet at an average rate of eight aircraft per year. It expects to invest USD100 million in the new venture in its first two years, a figure that suggests the fleet will be financed mainly through operating leases. Aeroflot generated about USD296 in revenue per passenger in 2012, or EUR230. This was a similar figure to TAP, Finnair and Lufthansa and more than twice the level of most European LCCs. 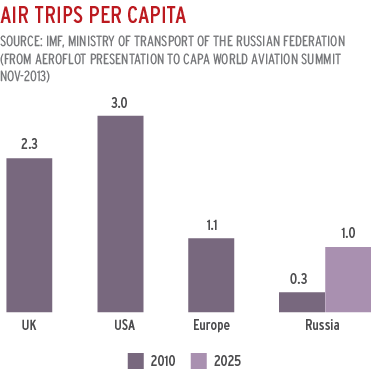 This suggests that Russia is ripe for price competition and stimulation by LCCs. Aeroflot’s plan for Dobrolet to have a 40% price discount would bring it broadly in line with other European LCCs, taking account of its longer average sector length, and is probably the right target level of discount to stimulate new demand. 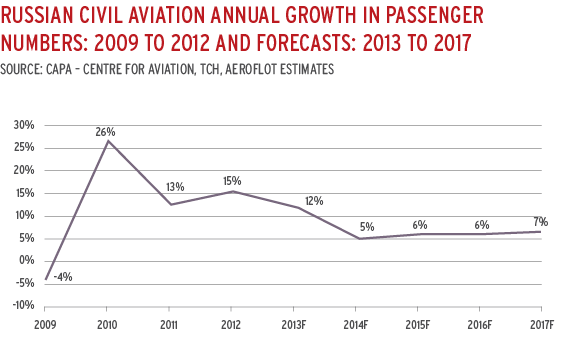 This is now starting to show itself in growing levels of profitability for Aeroflot. Unlike most other major European flag carriers, Aeroflot has been spared the competitive impact of the LCC revolution until now, but this could not be held back forever. The Government now appears to be seeking to usher in a new era of LCC-led aviation growth, but wants to give Aeroflot the opportunity to drive this development in the domestic market before taking it to international markets. Aeroflot is unlikely to have it all its own way: its major domestic competitors, Transaero and UTair have also expressed interest in establishing LCCs and foreign LCCs could be allowed into the domestic market at some point in the future. Nevertheless, Aeroflot will have a head start if it can execute its plans effectively and learn from the successes and failures of the LCC strategies of other legacy groups.